Stocked in Copper, Fungi, Metal Grey, Oxford Blue or Silver Grey Paloma Leather. All other are Special Orders. 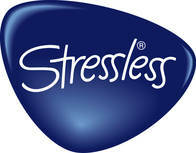 Stressless Live Small Recliner and Ottoman- Great back support comes in small packages! Also our Ekornes Authorized Price Reduction Sale is live!